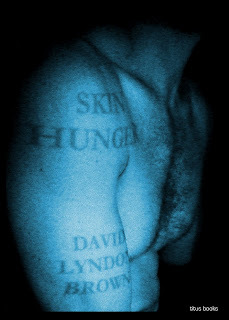 Maps has published a review of David Lyndon Brown's forthcoming collection Skin Hunger at the Scoop Review of Books. 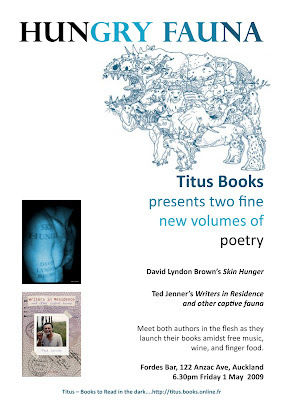 Personally I am excited about the Titus launch on Friday which will see both Skin Hunger and Ted Jenner's book Writers in Residence and other captive fauna come to fruition. It always feels a bit like celebrating the birth of a baby when a book gets launched - all the time and love that goes into producing them. My personal claim to fame with this launch is that I designed the cover of Ted Jenner's book and Maps wrote the introduction. Last night I was lucky enough to see a sneak preview of both books. I was not only excited by the cover of Jenner's book (!) but was drawn into his text and am looking forward to fossicking through it again. Jenner’s passion for adventure (he spent many years traveling and living in Europe and Africa) is brought to life in Writers in Residence. Look out for Map's review of Jenner's book in the near future. I started reading Skin Hunger last night and my first impression is that the language is beautiful, direct and emotionally honest without being over the top or cheesy. Brown's writing is intensely personal but he manages to make his poems open to us all. I am looking forward to reading more and am so pleased that Titus is publishing this collection. I hope that many people will read both new books and I look forward to celebrating with people at Fordes Bar on Friday. The large turnouts for Saturday's dawn ceremonies have confirmed the growing popularity of Anzac Day amongst younger generations of New Zealanders. The veterans of the First World War have departed, and the survivors of the Second are quickly following, yet more and more people with no first-hand experience of war are getting up before dawn on Anzac Day. The increased popularity of Anzac ceremonies has puzzled and worried some observers on the left. Ever since it was founded in the aftermath of the 'war to end all wars', the Returned Servicemen's Association has been one of the most fiercely conservative organisations in New Zealand, an apparently unthinking defender of all sorts of mouldy traditions. Leftist scholar and politician Bruce Jesson remembered how he and many of his Republican friends became the target of violent assaults from RSA members every time they went to the cinema in the 1960s, simply because they refused to stand when 'God Save the Queen' was played before the film they had paid to see began. The RSA took a hardline stance on military conscription, on conflicts like the Vietnam War, and on nuclear ship visits. It is not entirely surprising, then, that the increased attendances at the Anzac Day ceremonies the RSA runs have created some concern on the left. Is the new generation embracing militarist or ultra-nationalist ideas? Have they forgotten the RSA's lamentable political record? I don't think that the large crowds turning out for dawn ceremonies are inspired by nationalism, or by an affinity with the politics the RSA has traditionally represented. I suspect that it is the very distance of the World Wars from the experience of young New Zealanders that has inspired a deep fascination with the conflicts. As the wars move out of the domain of memory and into the territory of myth and history, they have begun to inspire a sort of awe which is quite alien to the typical jingoist. Twenty-first century New Zealand is a society where impassioned political debate about either domestic or foreign issues is rare. The major political parties offer very similar policy prescriptions, whether they are dealing with the economy or with international affairs. The forces which might prompt debate about fundamental features of New Zealand society are weak: the union movement has still not recovered properly from the defeats of the '90s, and Maori nationalism has been defanged for the moment by compromising leaders. Political horizons have been lowered, and a generation has grown up without learning the concepts with which they might make a critique of their society. Yet there is much that can be criticised in that society. The same neo-liberal 'reforms' which devastated the labour movement also atomised New Zealand, breaking up old communities based on shared values and creating a much more geographically mobile population united by a culture of consumption rather than a common vew of the world. In this environment, the history which Anzac Day commemorates seems both distant and strange. It is not only the epic events of Cassino or El Alamein that seem ungraspable - the society from which the New Zealand troops who fought at those places emerged also seems profoundly different from the one we inhabit now. The tight - sometimes suffocatingly tight - social ties and shared set of values of this society seem things of the past. So does the willingness of men and women to put their lives at risk in the name of a place and an ideology. Many of the young people who turn out for the dawn ceremonies have little interest in the actual historical events of the first half of the twentieth century. They do not care about the earnest historiographical debates over the causes of the First World War, or the reasons why the Allies were able to defeat Hitler. They don't care about whether New Zealand was justified in launching its tragicomic invasion of Turkey in 1915, or whether the bombing of Hiroshima represented a war crime or not. The essential irrelevance of the historical meaning of events like Gallipoli is shown by the lack of malice towards New Zealand's old enemies that the young attendees at dawn ceremonies show. The young Kiwis who travel to Turkey for the dawn ceremony at Anzac Cove, for instance, will happily sit down for a beer with Turks of their own age before and after the ceremony. Informal surveys by journalists in Turkey suggest that few of the tourists who go to Anzac Cove even know what the Ottoman Empire was, let alone the role it played in World War One. What draws young people to Anzac Day is a set of images which represent an implicit contrast to the world which they inhabit. They are captivated by the self-sacrifice of the soldiers who went ashore at Gallipoli - by the dissolution of the individual human ego in the midst of the great tide of nationalism and social solidarity which World War One at first created. The fact that the sacrifices of Gallipoli were pointless is of little import: the solidarity of the soldiers and their devotion to something larger than themselves has the power to bewitch a generation which has grown up being told that the purpose of life is the accumulation of consumer goods. The young people who attend Anzac Day commemorations are making an inchoate and implicit critique of the New Zealand of today. Fordes Bar is the only boozing establishment in New Zealand with its own political library, so it's always been a good place to celebrate May Day, the traditional festive day of the labour movement and the left. This year Fordes Bar will be a doubly attractive place to drink on May the first, because it's hosting the launch of two brand new Titus Books. There'll be music, speeches, finger food, and - if you beat Richard Taylor to the table - free wine from six-thirty, as Titus celebrates the arrival of David Lyndon Brown's Skin Hunger and Ted Jenner's Writers in Residence and other captive fauna. For many readers of this blog, David Lyndon Brown will need no introduction. His brutally beautiful 2007 novel Marked Men was launched in spectacular fashion, and prompted an extended debate at this blog. Like Marked Men and Brown’s book of short stories Calling The Fish, Skin Hunger explores a seedy but loveable Auckland of crumbling Bohemian villas, underfurnished apartments, twenty-four hour bars, and dodgy nightclubs in spare but nevertheless lyrical language. Ted Jenner is one of the more enigmatic figures in contemporary New Zealand literature. He has lived overseas for most of the last three and a half decades, teaching Classics at universities and schools and producing poems, translations, and scholarly articles in his spare time. 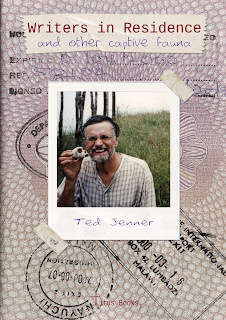 Before he returned to New Zealand a couple of years ago, Jenner spent almost a decade in Malawi, and wrote a series of accounts of the country for the Kiwi literary journal brief. Since his return Jenner has been busy preparing a selection of a his writing from the past thirty years for publication: the result is a book that is full of time and space. 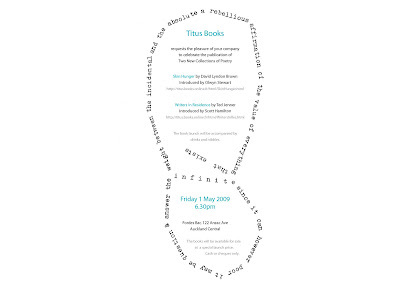 There's more information about next Friday night's event on this flyer (click to enlarge it), which also features Ted Jenner's concrete poem 'Heidegger's Instep'. 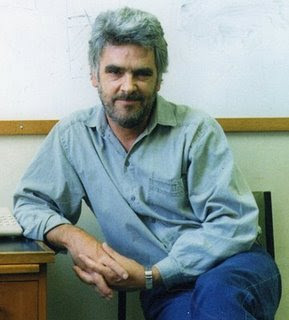 The Kiwi historian Mark Derby responded to my post on the late Franklin Rosemont with a tribute to the man that is so interesting and eloquent that it does not deserve to be left to languish in a comments box. As you can see from this photo, Mark was not exaggerating when he used the adjective 'hairy' to describe Rosemont. So long, Franklin, you hairy, helpful, hallowed old wizard of the left. 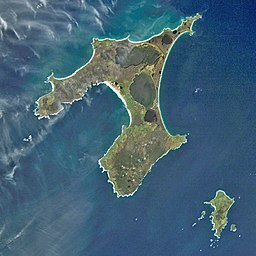 Rekohu, which translates as 'misty sky', was the name given to the Chatham Islands by their original inhabitants, the Moriori people. Rekohu is also the name of a weblog which provides an irregularly updated but fiercely pro-Moriori account of events on the Chathams. I concur with the assessment of the gentleman in question. I think he is a nutter! One comment that I feel obliged to reiterate though, because some of the esteemed scholars seem to forget it, presumably because they see it as being so bloody obvious is thus: the whole myth thing, whether perpetrated by the pakeha or by the Maori is actually irrelevant. Get over it for God’s sake! Moriori were. Moriori are! And Moriori will be. That is the important thing and the more that people continue to focus on the periphery of that, the greater creedence is given to bloody nutters such as that other bloke and the less mana, and significance is given to the actual story and reality of Te Imi Moriori. It is easy to understand Rekohu's frustration. Since the 1920s, when HD Skinner produced his classic study The Morioris of the Chatham Islands, the Victorian notion that the Moriori were a group of Melanesians driven from mainland New Zealand by aggressive, latecomer Maori has been discredited amongst scholars. Major archaeological digs on the Chathams in the '70s filled in many gaps in Moriori prehistory, and Michael King's 1989 book Moriori: A People Rediscovered synthesised a huge amount of research and the oral traditions of the Moriori themselves to create a compelling and accessible account of the history of the tchakat henu of Rekohu. King showed that the Moriori were the descendants of a group of early Maori who had arrived on the Chathams and had been unable or unwilling to leave. The cool climate, constant winds, and relatively small size of the islands led to important cultural changes, like the erosion of social destinctions, the adoption of a strict pacifism, and the abandonment of agriculture. In recent years scholars at the University of Auckland have put the icing on the cake, by using tests on rat bones to determine that the first settlers of Rekohu arrived from the northern part of the South Island around the beginning of the fifteenth century. The problem with Rekohu's argument that the old myth of the Moriori as pre-Maori New Zealanders is 'irrelevant', and should not be subjected to criticism, is that the myth has refused to die amongst the Kiwi public. Again and again, it is invoked during discussions of issues related to race and history. The current controversy over whether the city of W(h)anganui should have an 'h' added to its name has seen the Moriori myth bubble once again to the surface. Maori activists in W(h)anganui have long argued that, under the Treaty of Waitangi, their history deserves respect, and that this respect should extend to the proper spelling of traditional names. In a debate on the website of the New Zealand Herald prompted by the Geographic Board's decision that the name should change, a number of Pakeha opponents of 'Maori radicalism' used the Moriori myth to bolster their arguments. People want it changed to it's original name, that's fine, and I support that, but Maori are just one in a long line of people that have occupied this country. So the original names of these places wouldn't even be Maori. Sadly though, much of NZ's real history is sealed for decades by previous governments. History that shows NZ populated long before the maori. Historic finds are dealed off from public access, and worse, some maori tribes have bulldozed it over to keep the myth going that they are native to this country. Given the continuing currency of arguments like these, I think that the Moriori myth still needs to be countered publically, even if it is as dead as a dodo within the walls of academe. Rekohu himself seems to accept that the Moriori myth needs to be addressed, when he argues that Moriori history should be taught in New Zealand schools. It seems to me, though, that there is a complementary argument which can be made against those who invoke the Moriori myth. Invariably, those who invoke the myth, or the related and even more absurd myth of ancient Celtic New Zealanders, identify the indigenity of Maori, and the validity of agreements like the Treaty of Waitangi, with the fact that Maori occupied New Zealand before other peoples. All the evidence points to Maori being the first inhabitants of New Zealand, but even if they Maori were not the first New Zealanders that fact would not, in their eyes and in the eyes of the Treaty, stop them from being indigenous. That’s because Maori understand indigenity as something which derives not from first occupation but from a series of activities - taking possession of the land, naming it, burying the dead there, burying placenta there, and so on (it’s no coincidence that the Maori word for land is also the Maori word for placenta). If the near-impossible happened, and the remains of a pre-Maori civilisation were discovered, then the Treaty would not have to be torn up and Maori would not have to abandon their claims to be the tangata whenua of New Zealand. Indeed, there have already been Treaty settlements where groups of Maori have been recognised as indigenous, and offered certain resources, despite the acknowledged fact that they were not the first occupants of their rohe. A good example is the case of Kai Tahu, the iwi which was recognised as the tangata whenua of most of the South Island and given a range of resources in one of the first major Treaty settlements in the early ’90s. No Kai Tahu leader has ever denied that their iwi was not the first to take possession of the southern part of the South Island. The Waitaha and Ngati Mamoe peoples lived in the area before Kai Tahu arrived sometime in the seventeenth or eighteenth century. These prior peoples were either conquered or assimilated, or both, and Kai Tahu became the tangata whenua of most of Te Wai Pounamu. It was Kai Tahu, not Ngati Mamoe or Waitaha, who signed the Treaty, and the arguments about the Treaty concern whether or not the Crown honoured its obligations to Kai Tahu. If Ngati Mamoe and Waitaha had survived as distinct groups inside the territory Kai Tahu controlled, then the situation would be more complex. In the Chathams, Moriori were conquered by two Taranaki iwi in 1835, but the Waitangi Tribunal found that this conquest did not erase Moriori mana whenua on the islands, because Moriori had retained their culture and traditions. Moriori and the descendants of their conquerors both have rights under the Treaty of Waitangi. Those who claim that Moriori once populated the North and South Islands, or that Northland was once crawling with Celts, or that the Chinese built forts up and down the South Islands, cannot point to any person, John Wanoa aside, who claims descent from such phantom civilisations. They cannot show that the Maori groups which signed the Treaty of Waitangi were falsely claiming to control Celtic or Chinese land. They cannot demonstrate that Celtic or Chinese or mainland Moriori populations existed as subjugated peoples within the rohe of iwi which signed the Treaty. How, then, can the pseudo-historians use these phantom peoples as evidence of the illegitimacy of the Treaty of Waitangi? After a hectic two days drinking with sailors, wandering round archaeological sites, and being menaced by gun-toting, DOC-hating farmers in the far north - more details of those escapades in a future blog post, and in a chapter of Smithyland - Skyler and I suddenly found ourselves in Hamilton on a grey and drizzly Easter Sunday. Luckily for us, a large new show had just opened at the Waikato Museum and Art Gallery. The gallery's main exhibition space has been given over to a potted history of the Waikato Society of Arts, an organisation which has enriched the culture of cow country for over seventy years. The WSA has always been a determinedly pro-am body, and the exhibition includes work by little-known as well as famous artists. One work has been selected to represent each year of the WSA's existence, so that visitors can travel from the 1930s, when bad imitations of bad Goldies were the order of the day, to the noughties, when the work being produced in the Waikato seems both various and adventurous. There are many delights along the way - Tom Gardiner's massive and very seventies abstract diptych filled with Maddoxian crosses and slabs of brutalist grey is particularly exciting - but the highlight of the show, for me at least, is the emergence of two more Ted Bracey canvases from the gallery vaults. Bracey's North Island System, No. 1 seems to be one of a series of works he painted near the end of the years he spent in the Waikato in the second half of the sixties. It's a bright painting, full of cold blues and blustery whites, but I neglected it in favour of October No. 4, a large work which has the same unnerving beauty of the two Waikato paintings hanging downstairs. In October No. 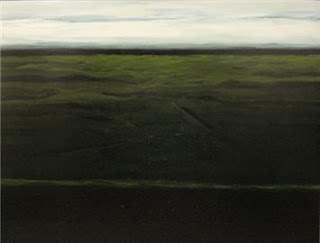 4, the artist has once again stripped his landscape down to essentials: a white line, a black line, a rippling field of deep, darkening green, and a bank of sky the colour of week-old snow. It is difficult to appreciate October No. 4 in reproduction, because the size of the canvas and the nuanced way Bracey uses his limited palette give the work much of its ambiguous power. Like the Waikato paintings downstairs, October No. 4 is capable of conjuring a mood of warmth and security, or a mood of unease. Is Bracey painting a green and pleasant land of dairy farms and scenic reserves, or a landscape which has been left undifferentiated by the ravages of the axe and the fire? Is the line in the foreground a river, running languidly through the landscape, or a road pushed through in an aggressively straight line? You saw some landscape in the gallery which spurred you into thought and art talk drivel. You seem to have changed your mind on how you felt about them. You asked some questions about whether this individual knew any colonial history of the area. Did you get a response? Did Ted answer you back with a defiant yes? Or no? I doubt it. Why? Because as an artist, Ted doesn't have to make those kind of statements. Ted's status as the revered genius allows him to transcend everyday unpleasantries, and allow you to ask such important questions about, say, does this landscape have any meaning whatsoever? Hurrah for art! Hurrah for Ted, and his nothingness! Jared's comments reflect his belief that artists should end their 'individualist' and 'subjective' ways, and instead dedicate themselves to 'collective' political activity aimed at bringing down the capitalist system. Artists should get out of their studios and galleries, and on to the barricades. If they must continue to produce art, it should reflect their 'social commitment' by clearly communicating an anti-capitalist message. For all of the radical rhetoric it's wrapped up in, Jared's response to my post about Ted Bracey betrays a very old and very common misapprehension of art. Like the art dealer who is guided by value rather than taste, and the TV viewer who grumps 'what does that mean?' when confronted by Hamish Keith extolling the virtues of a McCahon or Woollaston canvas, Jared is mystified by the recalcitrance of art. He wishes that Ted Bracey would come out with a clear message – that he would shout a 'yes' or 'no', in the manner of a propaganda poster or an ad for detergent. As EP Thompson was fond of pointing out, though, a poster and a painting are two different things. If we want to engage with an artwork, we often need to put aside the idea that it is supposed to communicate an unambiguous political message to as wide an audience as possible. We must treat a recalcitrant painting or poem not as a failed attempt to communicate simply and clearly, but as an attempt to gets us thinking in a creative, contemplative, dialogic manner - as something that can open our minds to new possibilities, rather than communicate what we already understand. 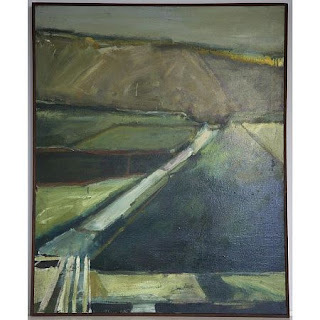 Ted Bracey's paintings speak powerfully of the connection that he felt with the Waikato landscape - a connection that seems to have been rooted in his rejection of the ugliness of urban American society, and which relied upon his memories of a childhood in the Hampshire Downs. Bracey's vision of an agrarian paradise probably owed a great deal to the Romantic tradition, which has been an important source of social critique in England ever since William Blake wrote poems like 'London'. Bracey's praise for life in the Waikato might remind us of the young Wordsworth's discovery of permanent, non-human values in nature, or of William Morris' counterposition of rural English communities to the ugly chaos of industrial Victorian cities. Yet Bracey's vision cannot be accepted unproblematically, because it glosses over the fact that the Waikato landscape, like the landscape of post-enclosure England, is an artificial creation, predicated on the dispossession of the people who once lived there. There is an ugliness that aches under the beauty of Bracey's canvases. I have suggested that Bracey is aware of that ugliness - that it lurks at the edge of his vision, and finds its way into his paintings, creating their ambiguity. I've argued that the condition of being in love with the 'beauty' of a landscape and yet being uneasily aware of the history that lurks under that beauty is very common in the culture of a postcolonial society like New Zealand. I grew up on a dairy farm, and was bombarded by the media, by the tourist industry, and by the backs of wheet bix packets with images that showed the levelled forests and cleared-out highlands of New Zealand as a 'clean green paradise' of sheep and dairy farms. It's not easy to expurgate such images, without expurgating a part of one's own heritage, and one's way of seeing. I think that many Pakeha feel, today, that they exist in a sort of uneasy twilight zone, caught as they are between a desire to acknowledge the injustices done to Maori and an awareness that they cannot disown their own history. The political right attempts to dispel the Pakeha’s feeling of unease with assimilationist rhetoric about how 'we're all New Zealanders now'; the far left often tries to banish the same unease with simplistic rhetoric about working class unity, and criticism of Maori nationalism as a distraction from 'workers' issues'. I think that Ted Bracey's paintings are powerful works because they do not dispel the ambiguity of feeling which is the part of the heritage of Pakeha. If Bracey had denied his emotional reaction to the Waikato landscape, and covered his canvases with some politically correct slogan about the theft of Maori land, then he may have created effective posters, but he would have failed to make art. By letting his conflicting feelings into his Waikato paintings, he captured something of the truth of Pakeha experience, and also created a space where viewers can dialogue with him and develop their own thoughts, rather than have a pre-prepared political meaning shoved down their throats. I don't think the recalcitrance and ambiguity of art like Bracey's renders it politically impotent. In fact, I think that the subtle way artists like Bracey work is just as important to left-wing politics as the work of poster makers and orators. Historically, the New Zealand left has been weak in the areas of theory and analysis, particularly as they pertain to local experience. Too many activists have been dissuaded from thinking about issues like Maori nationalism and the nature of Pakeha experience because they have been supplied with readymade slogans by politicians and poster makers. By encouraging us to think for ourselves, artists like Bracey open a space beyond political rhetoric where creative analysis can be done and new concepts can be coined. I don't know how Ted Bracey's paintings will affect my political thinking, as I'm still struggling with them, but I want to use another artist to give an example of the way that seemingly recondite canvases can have a palpable political effect on their viewer. Back in 2007 I looked at a series of new works by the Nga Puhi painter Shane Cotton. 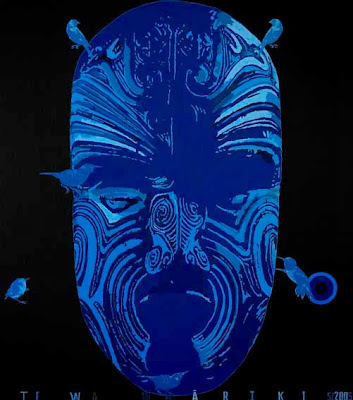 Cotton had placed a series of somewhat cryptic images - the stylised face of the Nga Puhi warlord Hongi Hika, smoked heads from the period of the Musket Wars, a variety of exotic birds, and several antique planes - on his large, mostly empty canvases. On a number of the canvases, the objects looked as though they were falling off the edge of a cliff, into a vast chasm. Some of Cotton's birds appeared to be floating in the chasm, but other objects looked like they were plummeting. When they were considered in the context of his earlier work, Cotton's paintings looked to me like allusions to the Maori experience of colonisation and modernity in the nineteenth and early twentieth centuries. I found Cotton's portraits of Hongi Hika, a figure who straddled the divide between pre-contact Maori society and modern New Zealand, particularly fascinating, because they eschewed the cliches that many artists and historians have used when depicting the man. Cotton portrayed Hongi Hika as a man of great mana, not a mindless murderer, but he also contextualised the chief, and suggested that he was, for all his power and exploits, a man whose actions were determined by his historical circumstances. Hongi was struggling to guide his people through their encounter with European power, but the methods which he used were often ill-suited to his task. I was very impressed by the way Cotton's paintings seemed to honour Hongi Hika without idealising him or taking him out of his historical context. At the time I encountered Cotton's paintings I was working at the Auckland museum, and I was also involved in the response to the so-called 'anti-terror' raid on Ruatoki and the arrest of the 'Urewera 14'. At work, amongst friends and relatives, and at protest marches and pickets, the air was full of arguments about Maori and Tuhoe nationalism, and about the correct Pakeha response to those phenomena. These arguments were particularly pungent for me, because I was working amongst Maori and Pasifika staff in the Maori Court of the museum, and was often asked by visitors to the museum about my attitude to the arrests and to Maori leaders like Tame Iti, presumably because I would be able to supply an informed 'Pakeha' view of these matters. I wasn't sure, though, how to relate my support for the right of Maori and Tuhoe to tino rangatiratanga with my attitude toward Pakeha history and culture. On the one hand, I was becoming more and more aware, through discussions with Maori and my own research, of the details of the oppression that Pakeha had visited upon the indigenous people of Aotearoa. On the other hand, I didn't think that simply dismissing Pakeha culture and history as worthless did anything to help educate the public about the past, or to build a movement against contemporary expressions of the oppression of Maori like the police raids that netted the Urewera 14. For obvious reasons, I couldn't agree with the Maori who told me that Pakeha should all get on a boat and head back to Europe. Shane Cotton's paintings helped me to find a more balanced approach to Pakeha history and culture, because they proved to me that it was possible to show respect for an ancestor without idealising him. Hongi Hika was a man responsible for the invasion of the rohe of half a dozen iwi and the slaughter of thousands of people, yet Cotton was able to show him as an explicable, if not entirely sympathetic figure. Thanks partly to Cotton, I've come to the view that Pakeha culture and history have to be acknowledged and contextualised, rather than merely condemned - that there is no point, in other words, of telling Pakeha that they should live in a permanent state of shame about their past. I now take the view that it is not Pakeha culture per se but the attempts of Pakeha to make their culture the only acceptable one for New Zealanders that must be countered by the left. In an article about the debate over the New Zealand flag, for instance, I argued that it is unrealistic to expect Pakeha New Zealanders to abandon their old flag, and identify with the tino rangatiratanga banner, but that it is unacceptable for them to claim that their banner represents the first people of Aotearoa. I argued, therefore, for the use of both flags, to remind us all of the messy and two-sided history of this country. Of course, my response the paintings that Shane Cotton exhibited back in 2007 was and is subjective, and the political conclusions that the paintings eventually prompted in me may not be shared by many others. Cotton's paintings do not make straightforward statements about Nga Puhi or Pakeha history, and our relationship to that history. They do not make straightforward statements about anything. They are enigmatic assemblages of images designed to work on parts of the brain that are untouched by prosaic, logical discourse. We bring our own meanings, our own needs and preoccupations, to our encounter with them, and take away an experience which is our own. The popularity of Cotton's art amongst members of his own Nga Puhi iwi - many of whom are the sort of working class New Zealanders without an education in art who, according to Jared Davidson, are not able to appreciate complex, enigmatic, allusive paintings - is a testimony to the power of his methodology. An encounter with an artist like Shane Cotton or Ted Bracey can be an equal, reciprocal one, in the way that an encounter with a poster can never be. Yesterday's Herald reported that neo-Nazis have spray-painted swastikas and anti-semitic slogans over a monument to the victims of the Holocaust at the site of the former Drancy Deportation Camp. During their occupation of France the Nazis used the camp at Drancy, a small town north of Paris, as a temporary home for tens of thousands of Jews destined for the ovens of Auschwitz and other death camps. Over at the website of Uncensored, the Auckland-based magazine which reprints the work of leading neo-Nazis, a similar sort of desecration is occurring, as conspiracy theorists try to justify their fondness for The Protocols of the Elders of Zion, the paranoid text that inspired the first generation of Nazis. Because it was a transit camp Drancy did not have gas chambers and ovens, but overcrowded conditions and inhumane administrators assured that many people never left its gates. One of the victims of Drancy was Max Jacob, who caught pneumonia there a few weeks after Nazi troops had frogmarched him out of the Catholic monastery where he had been hiding. One of the most influential of the avant-garde poets that France produced in the early twentieth century, Jacob was born in Quimper, the ancient capital of Brittany, to a Jewish family, but converted to Roman Catholicism after having a vision of Christ in 1909. Jacob's conversion was not taken entirely seriously by some of his friends, who were used to witnessing his debauched behaviour at Paris parties, and up until the end of his life he would oscillate between Bohemian and monkish behaviour. The head was nothing but a little old ball in the big white bed. The eiderdown of puce-colored silk, adorned with fine lace, resting perfectly on the seam, was facing the lamp. The mother in this white valley was caught up in big things, her dentures removed; and the son, near the night table with the scruff of a seventeen-year-old that couldn't be shaved because of pimples, was amazed that from this big old bed, from this hollow valley of a bed, from this little toothless ball, could come a marvelous, winning personality, and one as clearly congenial as his own. Nevertheless, the little old ball didn't want him to leave the lamp by the white valley. It would have been better for him not to leave it, because this lamp had always kept him from living anywhere else when he was no longer living near it. Last year I wrote a short poem about the last days of Max Jacob. I haven't published it offline yet, but I thought I'd put it here, as a small tribute to the man. That the law of equivalence tells us that a fish is a fish, that a star is a star, that a gorse spore is a gorse spore, that the sun is a fistful of nails. This is easy. The paint has flaked off Olaf's black knight, so that the creature must change sides. That the laws of geometry tell us where to stand. Even during noon inspection, a taller man provides a modicum of shade. Try to arrange one on each side. That the laws of literature tell us when to write. To watch the pen move is to watch it think, slowly, involuntarily, leaving lines as thin and regular as wire. I sit up on my elbows and squint at the page, looking for a hole large enough to crawl through. That morality tells us when to confess. Even before I was born I was plotting. That biology tells us how to live, how to go on living. Rot preserves by changing, makes us immortal as dust or fungi, as the soft log burning bright orange under my foot, when I step into the bushes behind the barracks wall to take a piss. That the laws of harmony tell us how to listen. One lies awake all night suffering the shrieks and howls, until at dawn the exhausted sobbing suddenly sounds like the Odet waterfall in a dry summer. It ends too soon. That the laws of anatomy tell us where to break. I heard the guards kicking a football about, and began to find the pitch and tone of their laughter strange, until Fischer's head rolled out of the barracks yard, and into view. Goal kick. A couple of months have gone by since the Christchurch-based Garage Collective declared war on New Zealand's arts community , whom they accuse of propping up capitalism and creating a breeding ground for fascism. According to the Garage Collective, artists who do not go 'onto the barricades' - ie, produce instantly comprehensible statements advocating the 'abolishment (sic) of the capitalist system' - deserve to 'die'. Garage Collective member 'Jared', who seems to have followed the lead of Kylie Minogue and jettisoned his surname as a bourgeois encumbrance, took the trouble to visit this site and explain the nuances of his group's statement to the enemies of the working class who lurk here. When I timidly suggested that Jared might like to visit an art gallery to find out more about the painters he professes to hate, the stern young foe of bourgeois ideology informed me that galleries were the haunts of 'elitists' who oppose the 'full participation' of the masses in art. Visiting an art gallery, according to Jared, is like 'voting once every three years' - that is, an exercise in 'sham democracy'. Because they merely 'contemplate' artworks, and do not participate in the creation of these works, the poor souls who visit Te Papa to look at Rita Angus or the Gus Fisher to view Milan Mrkusich are accomplices in their own oppression. What the Garage Collective advocates is the obliteration of the distinction between the producer and the viewer of art. In the ideal world of Jared and his comrades, the 'masses' would spent a proportion of their time painting enormous colourful murals expressing their democratically-formulated viewpoint on walls expropriated from the bourgeoisie. Resolute slogans about the 'abolishment of capitalism' and heroic images of muscle-bound workers manning the blazing barricades would be the order of the day. Though Jared would indignantly protest the comparison, the aesthetic credo advanced by the Garage Collective has much in common with the 'socialist realist' dogma which saw Stalin-era Soviet artists forced to paint smiling peasants harvesting wheat with shining sickles, in front of tableaux of soaring, smoke-capped steel mills built to fulfil the requirements of the latest five year plan. To be fair, Jared and his chums seem to have developed their aesthetic through a flawed thought process, not out of a desire to damage art. On paper, or on an obscure anarcho-Situationist website at three o'clock in the morning, the demand for the removal of the division between producers and viewers of art might seem admirable, and even workable. The demand lends itself to snappy slogans, and threatens to put the hustlers making a fortune from an out of control art market out of business. In the cold light of the offline day, though, it should be apparent that the destruction of the distinction between artist and audience is neither practicable nor sensible. Good art is usually a dialogue between its maker and its audience - a dialogue that depends on their differences, as their similarities. When we look at a painting or read a poem, we encounter a different view of the world, and we are forced to open a part of ourselves up to this different weltanschaung. At the same time, we interpret the work we are encountering in terms of our own experiences, and the world that created them. We enjoy a dialogue or, as Hans-Georg Gadamer called it, a 'fusion of horizons', with the work and the person we are encountering. And one of the great joys of art is the way that it allows us some insight into the ways that people from very different eras and cultures felt and thought. We are enriched when we experience ancient Greece through the poems of Theognis, or nineteenth century France through the paintings of Cezanne, or the history of the Tainui people through the sculpture of Brett Graham. Sometimes the dialogue between artist and viewer can be difficult, or even ill-tempered. For the past month, for instance, I have been having a series of rather fraught conversations with a man I never met and had barely heard of before he died early this year. Ted Bracey was born and raised in Britain, but in the sixties he emigrated first to the United States and then to New Zealand. Disgusted by the violent, dog-eat-dog society he found in the large cities of the States, Bracey settled down happily in the Waikato, where he soon found work teaching art. Bracey was a painter as well as a teacher, and he was soon at work on a series of canvases inspired by his new home. Bracey moved to Christchurch at the beginning of the seventies and stopped painting, but his bold, semi-abstract depictions of the Waikato landscape are still celebrated by critics and curators. The Waikato Museum and Art Gallery has decided to mark Bracey's death by exhibiting three of his paintings: a bright, furious abstract composition created during the artist's unhappy sojourn in North America, and two of his tributes to the Waikato landscape. All three works are worth seeing, but the canvases that have obsessed me for the last month are Winter Land Signals No. 8, which was apparently inspired by the landscape around the little Waikato town of Cambridge, and Tuatuamoana 2, which refers to an ancient, partially drained swamp in the eastern Waikato. Some of my in-laws reside in Hamilton, and I have found myself repeatedly taking long walks from their suburban neighbourhood to the art gallery, just to view Bracey's work. I've mysteriously vanished from a couple of family shopping expeditions to the central city to view the paintings, and I even left the test match between India and the Black Caps at Seddon Park early so that I could get in a quarter hour at the gallery. What, you might ask, am I getting so excited about? I can only begin to answer this question by reconstructing my first experience of Winter Land Signals No.8 and Tuatuamoana 2, the second of which is reproduced above. Bracey's canvases are an exercise in simplification, but that does not make then simplistic. He has taken some of the distinguishing forms and colours of the landscape around his adopted home, and eliminated what he considers inessential. Bracey's limited range of colours and repetitive forms give both paintings an 'all-over' effect that instantly reminded me, when I first set eyes on them, of the flatness of the Waikato landscape. It seemed to me that Bracey was taking a pilot's, or a bird's, or a God's-eye view of the land. Some of the paintings' forms - the dark, raggedly triangular shape in the upper left corner of Tuatuamoana 2, for instance - suggested the volcanic hills and mountains that punctuate the Waikato plain. Others, like the smaller, lighter-coloured triangles, might have represented human imprints on the land - they made me think of church steeples, of the arched backs of old farmhouses, and of old-fashioned TV aerials. But it was not possible for me to 'read' the shapes in Bracey's composition in a straightforward manner - he had provided just enough detail to stimulate my memories of the Waikato landscape. The rest, it seemed, was up to me. The colours in Winter Land Signals No.8 and Tuatuamoana 2 seemed similarly mysterious and liminal: somehow, they managed to be both sombre and bright. Bracey had applied his paint thickly, in rough, almost sensual brushstrokes, and even his dark greens seemed to emanate light. It is difficult for me to describe Bracey's canvases in this way, because they appeared to me not as assemblages of forms and colours but as complete, perfect objects. In fact, Winter Land Signals and Tuatuamoana 2 seemed so complete and so devoid of superfluity that I had difficulty imagining a time when they did not exist. Like the landscape which they so elegantly depict, they seemed utterly incontrovertible. There is no doubt that Ted Bracey loved the Waikato. In a tribute reproduced at the Waikato Museum and Art Gallery, he called the place 'generous on the one hand yet sheltered and intimate on the other', and compared residing there to 'living a long rich evening'. In a piece published in Art News last year, John Hurrell revealed that the Waikato reminded Bracey of the Hampshire Downs, where the artist had spent a happy childhood. 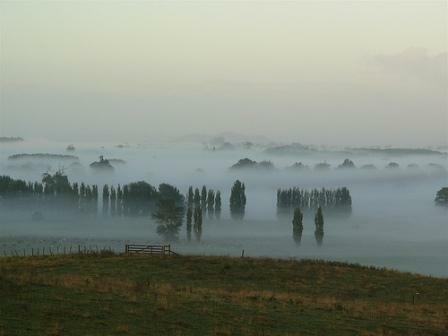 It was not hard for me to assent to Bracey's picture of the Waikato as a rural paradise. The evening after I saw Winter Land Signals No.8and Tuatuamoana 2 for the first time, I spent several hours helping Skyler's mother rid her garden of a number of massive palms. We dug the palms out of the cool, dark soil of her backyard, and threw their sharp-edged fronds and thick, rubbery trunks over her fence, into one of the deep volcanic gullies that course dryly through the outer suburbs of Hamilton. As the sun slowly set, a mist from the Waikato River spread over the fields and subdivisions on the far side of the gully, and blurred the view of Maungakawa, Maungatautari, and the Pukeatua Hills. The far-off hum of Hamilton's only motorway only added to the peaceful feel of the Saturday evening. 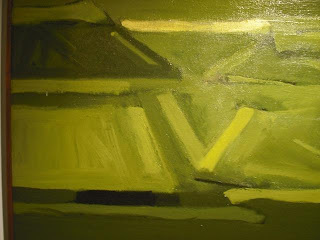 My head was full of the gorgeous shades of green and enigmatic, obscurely welcoming shapes I had found on Ted Bracey's canvases. As I walked toward the edge of Skyler's parents' yard to retrieve a palm frond which had failed to fall all the way into the gully, I slipped in the semi-darkness, and felt the heel of my shoe scrape something just beneath the lawn. I looked down, squinted, and saw a pile of small, bone-white shells. A midden. A pile of coins, their faces worn smooth with age. A pile of rubbish, which might one day become a small treasure, if a Masters student ever got around to excavating this small corner of the Waikato's immense plain. I carefully laid the green skein of turf back over the shells, and hurried off to the safety of a well-lit living room. My discovery had not been particularly remarkable - there are middens scattered all over the Waikato, and over most of the rest of North Island - but it did make me think again of Ted Bracey's canvases in the gallery down the road. Bracey found the Waikato idyllic, and drew comfort and sustenance from its landscape and light. How aware was he of the region's history? Did he know about the hundreds of years Tainui spent settling the area, fighting their way north from their base in Kawhia Harbour, defeating ragtag bands of maero, or wild men, planting stone mauri in the soil, to make it fertile, raising kainga and marae, and burying placenta close to the places where their children were born? Did Bracey know the names of great Tainui leaders like Hotunui and Te Whereowhero? Did Bracey know about the Waikato Kingdom, which arose in the middle of the nineteenth century to meet the challenge of the white settlers in Auckland, New Plymouth and other outposts of imperialism? Was he aware that the people of the Kingdom adapted the tools of the white man to produce and mill wheat, and to grow vegetables on a massive scale? Did Bracey realise that the Waikato Kingdom was the breadbasket of Auckland and a major exporter to Australia, before the British invasion of 1863, and the series of battles which broke the back of the Kingdom's army and ended with the retreat of the Tainui people across the Puniu River at the bottom of the Waikato, into the rugged country of the central North Island? Did Bracey care that the Waikato were punished for their 'rebellion' against the British Crown with the confiscation of most of their land? Did he know about the speculators and absentee landlords who bought up the confiscated land at bargain prices, then sold it on to struggling settlers who paid Maori a pittance to labour on fledgling dairy and sheep farms? Did Bracey suspect that the flat, symmetrical fields, hawthorn hedges, and oak groves he loved had taken the place of stands of massive kahikatea, deep swamps where millions of eels squirmed and swam, and vast kumara plantations surrounded by crooked stone walls and gravel pits? Was Bracey aware that the very Englishness of towns like Cambridge, with their white picket fences, picture postcard Anglican churches, and gridded streets named after Victorian generals, was intended to disguise the real history of the Waikato? How, I wondered, had I succumbed to Bracey's sentimental naturalisation of a wholly contrived environment? How could I have been so gullible? In an effort to answer these questions, I sneaked away from a family trip to the Sunday morning markets in central Hamilton, and once again confronted Tuatuamoana 2 and Winter Land Signal No.8. I brought my exercise book with me, because I intended to scribble some notes toward a critique of the colonialist art Ted Bracey had inflicted on the people of Hamilton. I would bring the man to account. What had happened? Had some mischevious member of the gallery staff put new paintings in place of the ones that had wowed me only a day ago? Had I misunderstood Tuatuamoana 2 and Winter Land Signal No.8 a day ago? Did I understand them then, and horribly misunderstand them now? Was Ted Bracey’s Waikato an idyllic, unspoilt place or a complex landscape marked by a long and difficult history? I was unable to answer these questions a month ago, and I am still unable to answer them today, after viewing Bracey's work on several new occasions. If I were pushed, I would say that I feel deeply ambivalent about Winter Land Signal No.8 and Tuatuamoana 2, and that this ambivalence reflects the way I have long felt about the landscape of the Waikato and other parts of New Zealand transformed by colonisation in the nineteenth and twentieth centuries. Christchurch-based poet Ross Brighton has made a belated but vociferous contribution to the debate about postmodernism, capitalism, and Kendrick Smithyman (his comment is the last in the thread). Thompson's Morris is a very fine book and should be read. However, two small reservations. Thompson's earliest essay on Morris is in the symposium published by Arena on defending British culture under the editorship of Sam Aaronovitch in 1952. Thompson's account here very much fits into the CPGB line of defending British culture against Americans and other nasty foreigners. The 1970s version [of the Morris biography] is not a "reprint" but a new edition which omits some of the most Stalinist formulations from the 1955 edition, but also accommmodates to the Popular Front line Thompson was pursuing in the nuclear disarmament movement. Grim and Dim is quite right to note the important changes that William Morris: Romantic to Revolutionary underwent before it was reissued in 1977. By the mid-'70s Thompson’s biography of Morris had become an accepted classic, helping revive scholarly interest in its subject. 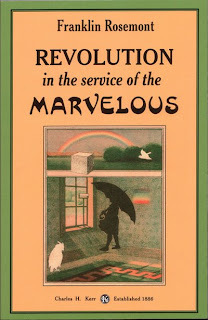 When Thompson was invited by Merlin Press to prepare a second edition of the book he chose to cut more than a hundred pages from the original, and add a long, closely argued postscript in which he refined his interpretation of Morris. Looking back on his first edition, Thompson decided that his desire to counter right-wingers who downplayed Morris’ politics had led him to assert too easily the ‘equivalence’ of ‘Morrisism and Marxism’. ...the moral critique of capitalist process was pressing forward to conclusions consonant with Marx's critique, and it was Morris's particular genius to think through this transformation, effect its juncture, and seal it with action. As tendencies [within Marxism] towards determinism and positivism grew, so the tradition suffered a general theoretical closure, and the possibility of a juncture between traditions which Morris offered was denied. I should not need, in 1976, to labour the point that the ensuing lack of moral self-consciousness (and even vocabulary) led the major Marxist tradition into something worse than confusion. News from Nowhere was neither intended as a model for socialism nor as an idealised picture of the historical process: it was designed to stimulate the imagination. Is a writer the deterministic product of his environment, or, on the contrary, is he capable of deploying a (relatively) new consciousness upon his immediate society? If such a deployment is possible, does it have any effect? And if so, how is the effect manifested? ‘Poetry and Commitment’ has no truck with those who would judge a poet’s political import by the political stances expressed in his or her work. Thompson uses Yeats as an example of a poet with ‘pitifully bad’ political ‘opinions’ who nonetheless wrote poetry marked by a ‘compassion’ that can never be considered reactionary. In Thompson’s view, there was a disjunction between the opinions Yeats ‘tried on’ and ‘the values that impelled his choice’. By making a distinction between immediate political ‘opinions’, on the one hand, and ‘values’ that are anterior to these opinions, on the other, Thompson is able to insist upon the relevance of politics to poetry without succumbing to the didactic ‘socialist realism’ he had learned to hate in the Communist Party. I don't think that the changes that Thompson's study of Morris underwent in the seventies vitiate the point my lecture made about the unconventionality of the original 1955 version of the book. The fact is that in the late '40s and early '50s Thompson did feel besieged by both the culture bureaucrats in the Communist Party, who insisted that the arts should be mere expressions of the party line, and the determinedly 'Natopolitan' intellectuals gathering around journals like Encounter and presses like Faber and Faber. Thompson's adventures in the Morris archives were, in one sense, a response to the political impasse of the early Cold War, an attempt to find space to think in the past and in the work of a great precursor. The Morris biography was at once a flight from reality and the presentation of an alternative vision of reality. In this sense, it had some of the same qualities as Morris' utopian fictions. In his 1976 postscript to the book and in 'Poetry and Commitment', Thompson develops rather than revises the ideas in his 1955 text. Grim and Dim refers to Thompson's 1952 text 'The Murder of William Morris' for the Communist Party magazine Arena, and suggests that there is a yawning gap between this text and the 1977 edition of the Morris biography. We have to be careful when we interpret the 1952 text, because it is the summary of a talk which Thompson gave at a Communist Party day school on culture. We do not know whether Thompson himself prepared the summary, but we do know that Thompson often complained that the Communist Party's publications doctored the texts he gave them by editing them heavily. Even if we set aside these caveats, it is by no means clear that 'The Murder of William Morris' endorses the Cold War Communist Party's line on culture. The anti-Americanism and British cultural nationalism which are part and parcel of the text have their origins in the Popular Front policy which the party adopted in the middle of the thirties. Desperate to win intellectuals to its ranks, the party had promoted itself as the guardian of the best achievements of British culture against the philistinism of the local political establishment and the fascism that menaced culture on the European continent. From the mid-'30s until the aftermath of World War Two, the Communist Party had a generally relaxed attitude to artistic and literary matters, an attitude which was reflected in the eclectic and successful journal Our Time, which was edited by Edgell Rickword, a modernist poet and critic who had made a name for himself as the editor of the influential Calendar of Modern Letters and as author of the first English-language book about Arthur Rimbaud. In retrospect it can be seen that the shadows of the Cold War were closing in, the radical ‘populist’ euphoria of 1944 was collapsing…That time produced one of the sharpest mental frosts I can remember on the Left. Vitalities shrivelled up and books lost their leaves…the stream of ’apostates’ was so full that all of us were apt to recoil, willfully and unthinkingly, from the brink of any heresy for fear of toppling into the flood. 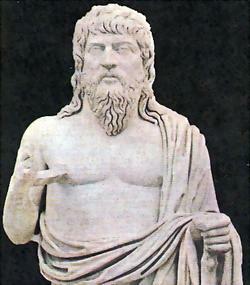 And we had become habituated to the formal rituals of ‘criticism and self-criticism’ - in origin an admirable democratic process, but one which had become perverted into a ritual in which the criticism came always from the Party’s senior spokesmen on cultural matters…and the self-criticism was intoned by congregated intellectuals in response. I attended a disgraceful meeting, at which Emile Burns scolded Rickword and Swingler for their political, cultural, and financial sins and omissions…It was a shameful episode and I shared in the shame, for, however ‘youthful’ I was, I had allowed myself to be made use of as part of the team of uncultured yobbos and musclemen under the command of the elderly Burns. Thompson seems to have learnt his lesson well before 1979. The year after the Our Time meeting, Jack Lindsay was attacked at a party conference on culture for his unorthodox views on art and his advocacy of Marx’s 1844 manuscripts. Lindsay remembers that Thompson, who had arrived at the conference ‘travel-worn, having just returned from Yugoslavia’, was his sole supporter. Whatever their merits, then, the anti-Americanism and British cultural nationalism which are features of 'The Murder of William Morris' are more likely to be the products of the Popular Front politics he learned in the '30s and '40s than of the Zhdanovism that Thompson despised.